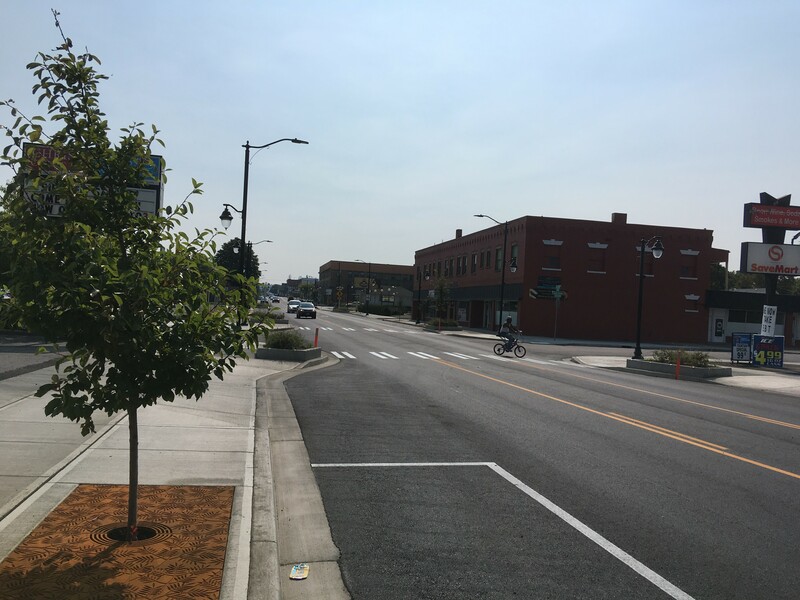 New pavement, sidewalks, parking and streetscaping are shown on the first day North Monroe Street reopened to traffic, Thursday, Sept. 6, 2018. After a months-long closure for a multimillion-dollar revamp, North Monroe is back open to traffic. Instead of the old five lanes, there's now a single lane in each direction on the north stretch with a center turn lane. Drivers heading north on Monroe through the intersection at Indiana/Northwest Boulevard now need to merge right, as the left lane ends and traffic continues north. The new configuration leaves room for more street parking, improved sidewalks, bump-out curbs that make it easier for pedestrians to cross the street and for drivers to see them, and new "streetscaping" that includes planter boxes and trees. The work started in April and barriers were officially removed Thursday, Sept. 6, as the city reopened the entire stretch to traffic. The project had concerned many businesses along the corridor who feared the loss of traffic and customers throughout the months of construction, prompting the city to pay for the Meet on Monroe marketing campaign. In a big final push to celebrate businesses along the corridor and the end of construction, there'll be a big party on Saturday, Sept. 15, with a variety of events lined up throughout the day. There's the Cruise on Monroe car show and fundraiser, hosted by the North Monroe Business District; the second annual Trailer Rally hosted by 1889 Salvage Co. will bring vintage, restored trailers together in the business's parking lot for tours; Mutts on Monroe will bring dogs and people together for pooch-themed treats and raffles hosted by Diamonds in the Ruff and Washington Basset Rescue; a North Monroe blood drive will take place at Kingsley & Scout; the Be Still Kids Community Celebration will feature yoga, a photo booth and more hosted by Be Still Kids: Yoga & Mindfulness for Kids; a temporary community mural project will be worked on in collaboration with Spokane Arts; and more.